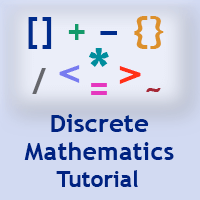 Discrete mathematics Tutorial provides basic and advanced concepts of Discrete mathematics. Our Discrete mathematics Structure Tutorial is designed for beginners and professionals both. Discrete mathematics is the branch of mathematics dealing with objects that can consider only distinct, separated values. This tutorial includes the fundamental concepts of Sets, Relations and Functions, Mathematical Logic, Group theory, Counting Theory, Probability, Mathematical Induction, and Recurrence Relations, Graph Theory, Trees and Boolean Algebra. Before learning DMS Tutorial, you must have the basic knowledge of Elementary Algebra and Mathematics. Our DMS Tutorial is designed to help beginners and professionals. This tutorial has been making for students pursuing a degree in any field of computer science and mathematics. It endeavors to help students grasp the fundamental concepts of discrete mathematics. We assure that you will not find any problem in this DMS Tutorial. But if there is any mistake, please post the problem in contact form.